Gabe and I love movies and we were really excited on our house-hunting trip when Audren mentioned that some movies are played in their original language with sub-tities. This meant that until we are fluent in French, there was hope for us going to enjoy our favorite pastime and actually understanding what was happening on screen. And, thus, this week a highlight for us was actually figuring out how to go to a movie. We went to the English speaking site, http://www.cineman.ch/en/ . 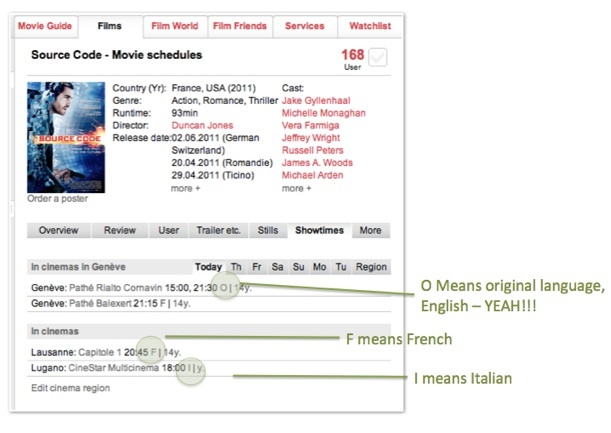 Movies are marked according to what their original language is. In this case, we looked for a O for “Original”. So, our first movie in Switzerland was Source Code for 36 CHF for two of us for a matinee. 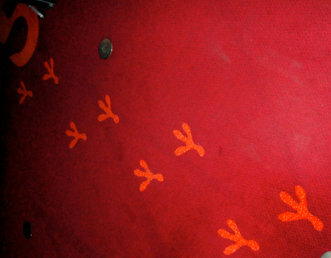 Also, the Virginia Tech Hokie Bird must have also been to see Source Code. He left his tracks going into the theatre #5 where our movie was playing, as seen below. Anyhow, it made me smile….I can’t wait until we come back, likely for The Hangover 2. This entry was posted in Life in Geneva. Bookmark the permalink.